On Saturday the 9 of December, Lasallian Mission Council's 'Share the Mission Program' honoured its 2017 Volunteers with a Celebratory Mass and dinner held at St Bede's College Mentone, Melbourne. Wrapping up for the year, the Program Debrief was held in Belgrave Heights (Dec 6-9), where Kate Westhead, Lasallian Volunteers Program Manager and Amanda Proulx, Assistant Director of Formation (Young Lasallians) and Patrick Hurst, Lasallian Youth Minister from St James College (Bentleigh) led a four-day debrief session with eleven volunteers. The sessions created various opportunities for each STM to provide their own in-depth feedback and analysis about their personal journey as a Share the Mission Volunteer. Kate Westhead said of the STMs, "This year's volunteers have been commended so highly by their placements. It was an honour to facilitate the debrief, where I heard more about their year of Service. It was a privilege to get to know them more as the outstanding Young Lasallians they are." Several workshop discussions were held on the challenges encountered, lessons learned and the many highlights from their 11-month placement. The debrief provided insight on readjusting to life at home and strategies for self-care, facilitated by Sonia Thompson from yourtown. Executive Director of LMC, Merv McCormack, held a Q & A with all the volunteers and gave his appreciation for their generous contribution and year of commitment in their placements. Family, friends and Brothers attended the Celebratory Mass and Dinner. For many of the volunteers, it was their first reunion with family. Scott Lealaisalanoa (STM) undertook his placement in Hohola PNG, was given a surprise visit by his very proud mother who flew in from New Zealand. Scott will continue as a Lasallian Volunteer in 2018, based in Sydney. The Mass was led by Father Brendan Dillon who said of the volunteers, "Well done for what you have accomplished this year and for opening your hearts and minds to the program." Over an amazing dinner provided by St Bede's, each volunteer presented a personal account of their placement and what it meant to them. Daniel Wells who fulfilled his service in Middle Swan Perth said of his experience. "I believe I have seen a lot of changes in myself, I care more deeply about social justice issues such as poverty, asylum seekers and respecting and acknowledging Aboriginal culture. I have come to realise that as a young adult and as a person in general, I can no longer ignore the issues that are rife in today's society. Through these students, I've have seen firsthand that change does not occur without influence." 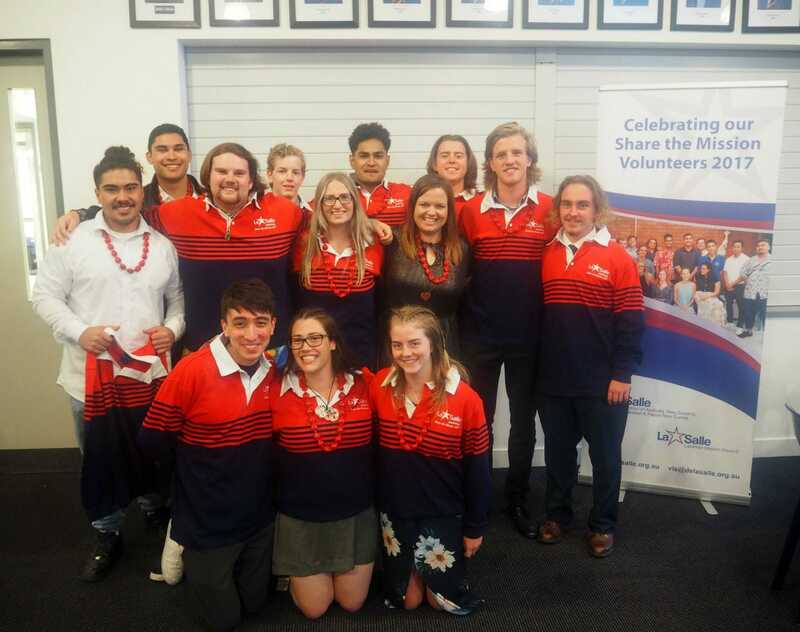 With several key placements in Australia, New Zealand and PNG, all volunteers provided colourful and genuine insight while giving thanks to LMC for the opportunity. "I feel more confident in my abilities and have a deeper understanding of my faith," explained Tacy Aitchison who undertook a placement in Middle Swan, Perth. "I wanted to give back what my Lasallian schooling gave to me," William Peters (STM) explained of his experience working with yourtown and staying with the Brothers community in Bankstown. Concluding the many wonderful accounts of the evening, Br David Hawke said, "What you have achieved this year speaks volumes about who you are and the spirit of generosity and service that characterises your lives. Thank you for making yourselves available for the Mission in 2017. You have been wonderful ambassadors for your families, schools, and countries." A big thank you to all who contributed to the program debrief, Mass and dinner thank you to Ria Greene, Br David Hawke, Amanda Proulx, Br Anthony Cummins, Br Garry Coyte, Merv McCormack and Patrick Hurst, Sonia Thompson, Luke McShane and Fr. Brendan Dillon. "I can't wait to see what the next group of volunteers in 2018, bring and receive from the Lasallian Volunteers program," said Kate Westhead. To learn more about LMC volunteer opportunities available for Young and Adult Lasallians, please contact Kate Westhead.